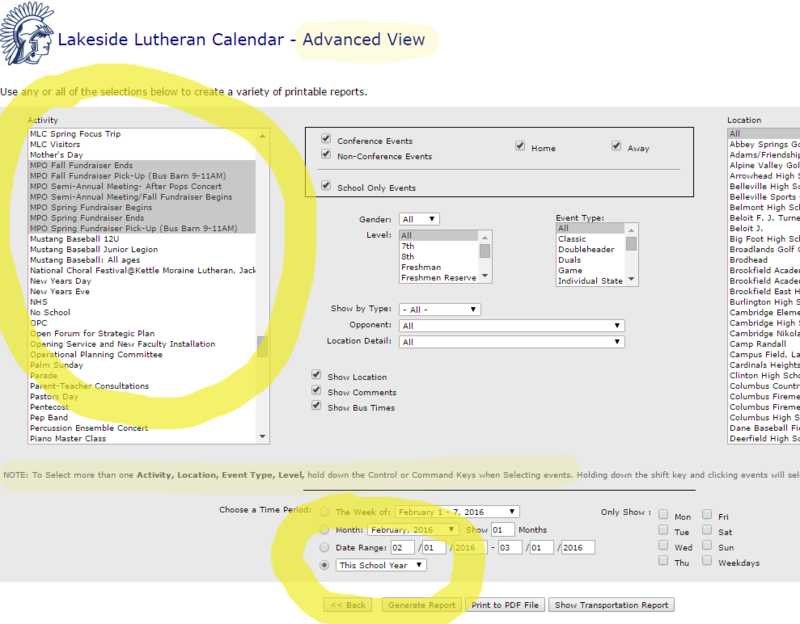 Lakeside Lutheran keeps a comprehensive calendar using a third-party called rSchool, used by many schools in the WIAA and Capitol Conference. When you link to the calendar from the home page, or when you click rSchool under the Athletics menu, you are taken to an rSchool website page that lists all the week's activities. You can choose to view in alternate formats from choices on the page, such as a daily or month view. Go the "Advanced View Report" below the sports schedules selection box. The window that opens is the same type of schedule that can be subscribed to from the upper right corner of the sports schedule pages. You can also select certain days of the school year that are not part of a specific group, such as concerts or days off school. Right now it means you need to scroll through and select the possibilities under the activity menu, but then you can import them to an online calendar or phone. LLHS publishes its upcoming school calendar to the rSchool calendar late in spring. Some look for certain dates earlier than spring. If this is you, try this Projections calendar which has major event dates for the next school year and beyond. The attached document was last revised January 8, 2018. Some churches, schools and individuals like to have major dates on one page. For this we created the one-sheet calendar for the current school year. The next school year's version will be published in late spring after the full calendar has been determined. Lakeside publishes a calendar of special interest to our Lutheran Elementary Schools (LES) that includes highlught dates for the current school year, along with projected dates of the Fine Arts Fair and LES Basketball Tournament for 2-3 years.